What would you do with 3 million dollars? It’s a fun hypothetical question for most, but for one Inland Empire resident it has become an astonishing reality. The Riverside County local hit an IGT Wide Area Progressive jackpot Megabucks® machine on Labor Day September 4th, 2017, a night never to be forgotten. The local, choosing to remain anonymous, became an instant multi-millionaire after winning the progressive jackpot for $3,222,044 at Soboba Casino in San Jacinto, California. The local was ecstatic with the win. The lucky three dollar bet quickly distinguished the winner as the recipient of one of the largest jackpots awarded in the history of not only the Inland Empire, but Southern California as a whole. 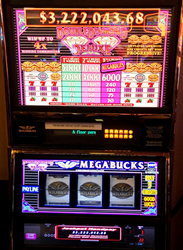 The jackpot hit on the IGT Megabucks Double Diamond Deluxe game – one of IGT’s most popular slot themes. Last year Soboba Casino was voted “Luckiest Casino” in the Southern California Gaming Guide’s Reader’s Choice Awards, and it appears they are living up to that name. With more than $143.2 million dollars in jackpots won over the past five years, it is clear that Soboba Casino is the best choice for players looking to come out on top. Gaming giant IGT representatives came to Soboba Casino shortly after the jackpot was announced to verify the win. Soboba Casino features approximately 2,000 of the newest, hottest slot machines, an expansive and modern non-smoking room, 20 classic gaming tables featuring all your favorite card games, and a large outdoor event arena which easily accommodates over 10,000 people. Need to recharge & refresh? Visit the cozy Soboba Cafe and Coffee Kiicha, or experience AC's Lounge with full cocktail bar and three giant HD flat screens including the "Sobobatron", the Inland Empire's biggest HD video wall.